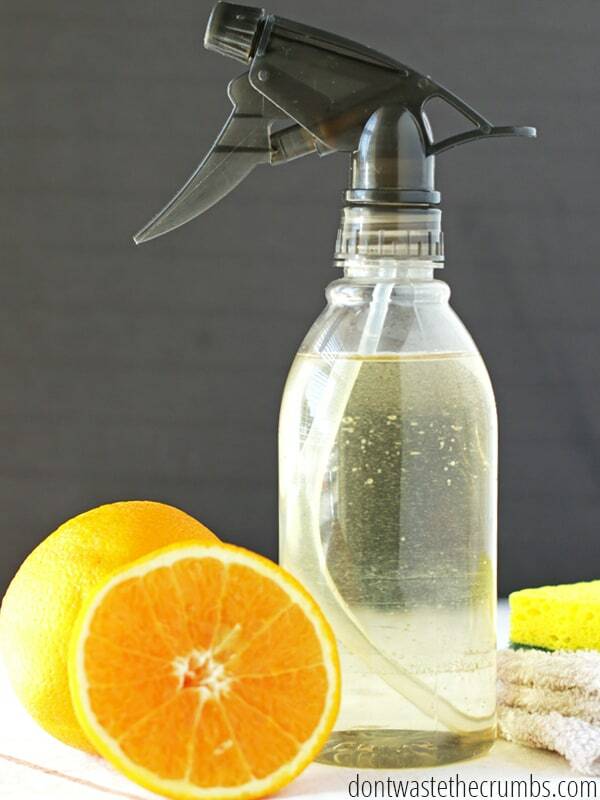 Earlier this year I hosted a chemical-free living challenge, showing you how to replace dangerous chemicals in your house with natural cleaning options that were just as effective. We worked through one area at a time, focusing on the rooms and spaces that would affect us the most: kitchen, bathroom, laundry and personal care. I knew the chemicals in commercial cleaners were dangerous, but I had NO IDEA just how harmful household cleaners could be! Why bother cleaning up our cleaning products? Because chemicals are everywhere. On average, women use about 515 chemicals on a daily basis and don’t even know it. Think it’s not possible? Think about this. Which of these do you use as you get ready in the morning? And then as you go about your day? What if it’s cleaning day? I looked up the ingredients in my old foundation and there were 42 ingredients listed. And that was just ONE item I used to use! Considering this, I don’t doubt whatsoever that the average woman hits 515 chemicals. Are chemicals really that bad? Remember how eggs used to be bad for you? And then as time went on and more studies were conducted, it turns out that eggs were actually good for you? Common household cleaners are similar. As more studies are done, scientists are learning that chemicals cause more harm that we initially thought. Anywhere from 65,000 to 100,000 chemicals on the market today have NOT been tested for safety. When a chemical is tested, toxic labeling is only required if 50% or more of the animals tested die. The government doesn’t test the safety of chemicals in every day cleaners, nor do they require the manufacturers to test them either. The average home has 50 times the level of chemical exposure that the Occupational Safety and Health Administration (OSHA) defines as standard. Only 5-10% of cancers are genetic. That means 90-95% of cancers are caused by our environment. The type of harm these chemicals can do. In as little as 26 seconds after exposure, chemicals can be found in the human body in measurable amounts. Wait – I thought this was a food blog? 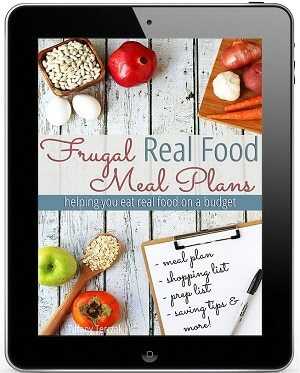 You’re right – my primary focus here is helping you eat real food on a budget. 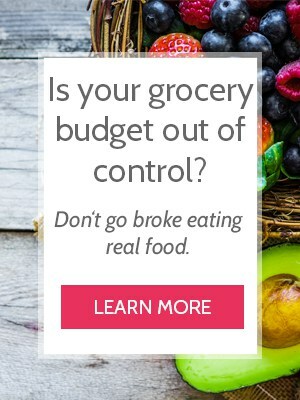 That means showing you how to be an amazing shopper, sharing family-friendly recipes that don’t break the bank, and teaching you the basics of real food – like reading ingredient labels. But once you’re in the habit of reading food labels, you can’t help but read the labels on everything else too. 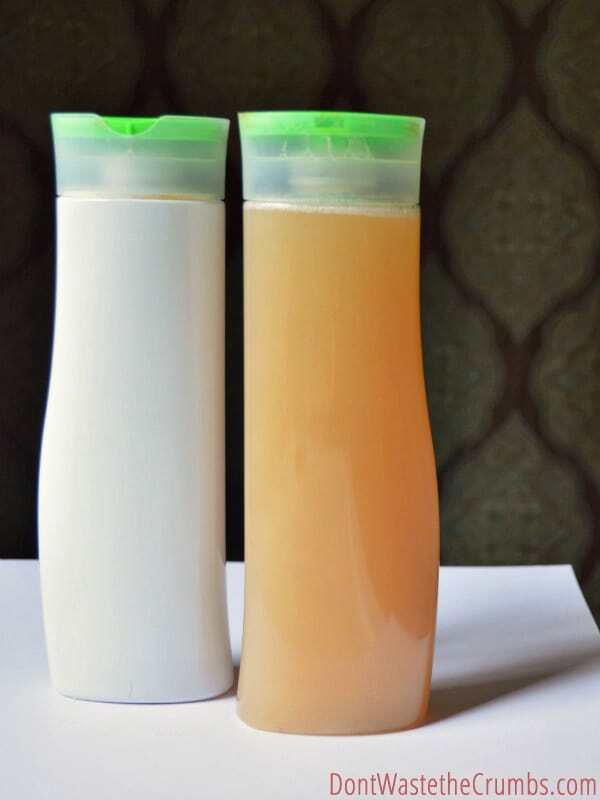 Several years ago (when I first felt like I had a grip on what we were eating and how to stay in budget each month), I turned over a bottle of body wash while taking a shower. And I had NO IDEA what in the world those ingredients were. How could I say “no” to eating trans fat and highly processed sugar while saying “yes” to a body wash that irritates the skin and respiratory system and is toxic to my organs? Or intentionally washing my newborn’s clothes in “specially designed” newborn laundry detergent that contains chemicals KNOWN to be carcinogenic, cause skin irritation and disrupt hormone production? 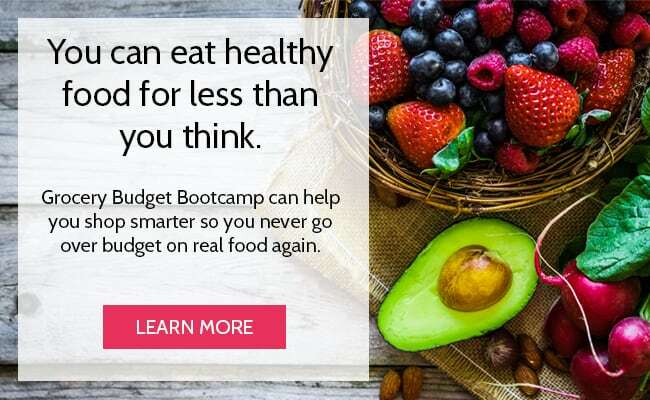 If I was being so diligent in the kitchen for the sake of my family’s health, I couldn’t be willy nilly about what products we use in the rest of the house, so natural living on a budget became a secondary focus. What about those natural cleaners you can buy? This makes me angrier more than anything, because I got duped too. I trusted a company to make good choices on my behalf and subscribed to have “natural” cleaning products delivered to my door. But when I looked those cleaners up online (using the Environmental Working Group and the Think Dirty apps) and looked up each individual ingredient, they weren’t any better than the ones I could get at the store! This whole time I thought I was doing better by choosing the pricier “healthy” cleaners, when there was no point in switching. They weren’t any healthier and they cost me 2-3 times as much! I was disgusted, disappointed, and angry. I no longer use that company (and don’t recommend them anymore) and instead have found a plant-based option that I truly love. It’s safe for my whole family, it WORKS better than anything I’ve ever tried before, and it costs me less!! I know how easy it is to give up when you’re overwhelmed, so one of my goals is to offer practical advice in bite-size pieces. This way, you can make small changes that matter now and that will stick around for the long-term… WITHOUT being overwhelmed. And that’s where we are today. After spending 30+ days immersed in harsh chemicals found in the house, I’ve consolidated the worst offenders. As you work towards a healthier home, start with this list. Start at the top and slowly work your way towards the bottom. Maybe pick one item to work on each month, or focus on improving one area in the house one month at a time. However you approach it, know that even small steps are progress. Whether you run a marathon or walk it, the end result is still the same. You breathe in these chemicals as your clothes then off-gas in your closet and bedroom. You come in contact with these chemicals as you wear your clothes all day long (and they touch the most private parts of your body!). And you could even add a third effect, which is forcing other people to breathe these chemicals too. Not too long ago my kids and I walked by a man in Walmart who smelled like a very popular laundry detergent and fabric softener. The smell of his clothes was so overpowering, we had to go to a different part of the store until he finished shopping and was out of the area. It was more than simply not wanting to breathe around him – we couldn’t! Skip the fabric softener altogether. Use ¼ cup baking soda to soften clothes and/or ¼ cup vinegar to help with static cling. You can also dry clothes on a lower setting, switch to natural fibers over time (like cotton), line dry your clothes or use 100% wool dryer balls to speed up the drying process while eliminating static. I use these wool dryer balls and dry my clothes on medium instead of high heat. For a mild scent, I add 1 drop of Thieves essential oil to each dryer ball before each load. I totally understand wanting the house to smell good, but according to the Environmental Protection Agency (EPA), air fresheners are just one of many sources of volatile organic compounds (VOCs). VOCs can cause immediate symptoms of headaches, dizziness, visual disorders, memory impairment, and eye and respiratory tract infection. Over regular use and time, VOCs can lead to loss of liver, kidney and central nervous system damage. Air fresheners also contain formaldehyde, phthalates (more on these in a minute) and 1,4 dichlorobenzene (1,4 DCB) (a known human carcinogen). Open the windows when weather permits to allow fresh air to circulate throughout the house. Enjoy the way your house smells naturally, like how it smells sweet when you bake oatmeal chocolate chip cookies or when you dehydrate strawberries. Use homemade carpet refresher when you vacuum to get rid of hidden smells. Bathe your pets often and if you want a certain scent, consider stove-top potpourri made with food scraps. I have a diffuser in the major areas of my house: kitchen/living room, office, and our bedroom. If I need to get rid of a funky smell (like the time I made fish sticks!) or if I want the room to smell like Williams Sonoma, I use my diffuser. I could specifically call out shampoo or body wash here, but really anything you put on your skin is up for grabs because of two big ingredients: phthalates and parabens. They can damage the liver, kidneys, lungs, and reproductive system – particularly the developing testes. While phthalates seem to affect males and the male reproductive system, parabens are equally damaging for everyone. Parabens are known to disrupt hormone function, an effect that is linked to increased risk of breast cancer and reproductive toxicity. Parabens mimic estrogen by binding estrogen receptors on cells. Be diligent about reading labels! Look for products that are free of both phthalates and parabens. It might mean making your own, or spending a little more to buy a better quality product. If the budget is a concern, start with whatever personal care item you use most often. Make it a goal to either make it yourself or buy a better product instead of buying the same thing again. Another option is to DIY or buy better as you run out of things. In either case though, the goal should be for all personal care items parabens and phthalates free. My whole family uses goat milk soap from Bend Soap Company for our hair, face and body. 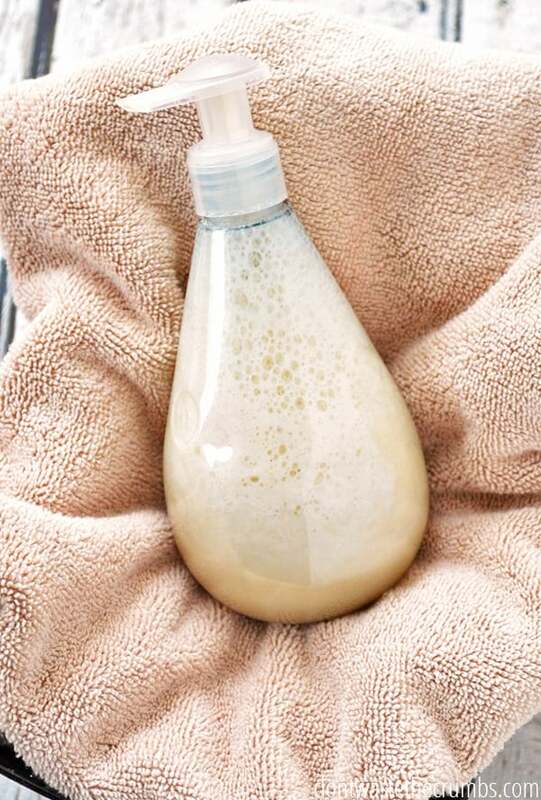 If we need it, I make our own homemade conditioner. I use toothpaste from Young Living in lieu of deodorant (yes, it works!) and we also use Young Living toothpaste when I’m not making our own homemade toothpaste. My face lotion is coconut oil and Frankincense essential oil. The University of Washington did a study on laundry detergent and found that every product they tested emitted one or more carcinogenic “hazardous air pollutants” which the Environmental Protection Agency (EPA) considers no safe exposure level. The air surrounding the detergent contained SEVEN compounds that are regulated as toxic or hazardous under federal law. Like fabric softeners, laundry detergents also seep into clothes, off-gas in closets and bedrooms and then come in contact with your skin on a regular and on-going basis. It’s important to choose laundry detergent that isn’t full of harsh chemicals! You want to use a brand that lists the ingredients on the label (remember that companies are NOT required to disclose the ingredients). Avoid synthetic fragrances (natural fragrances like those from essential oils are okay). Seek out brands that use naturally-derived ingredients. While I haven’t personally used it, I’ve heard good things about Biokleen, this specific version of Seventh Generation and eCover Zero. These all rank well on the Think Dirty app. After realizing that my own homemade laundry detergent wasn’t actually cleaning my clothes, I switched to Young Living’s Thieves Laundry Soap. It took out armpit stains in one wash, removed a five-year set in stain on my comforter and it lasts me practically forever. We wash on average 5 loads of laundry each week and I’m still on the first bottle… that means it’s lasted me nearly six months! Tip: You don’t need a lot of detergent to get clothes clean, so to get the most loads possible, use either a measuring spoon for powder or a glass pump bottle like this one. Thieves Laundry Soap is liquid and I only need ¼ capful per HE load. I pour the soap undiluted into the glass pump and use 3 pumps per load. This ensures we’re only using what we need to and get as many loads as possible out of each bottle. At the rate I’m going, I should get 170 loads out of the one bottle! The EWG shared that a chemical often found in fragrance, styrene, can cause cancer according to the National Toxicology Program. Second, they don’t necessarily work! How can I advocate to use vinegar to clean when it doesn’t actually clean?! If you prefer the DIY route, castile soap passed the cleaning test. 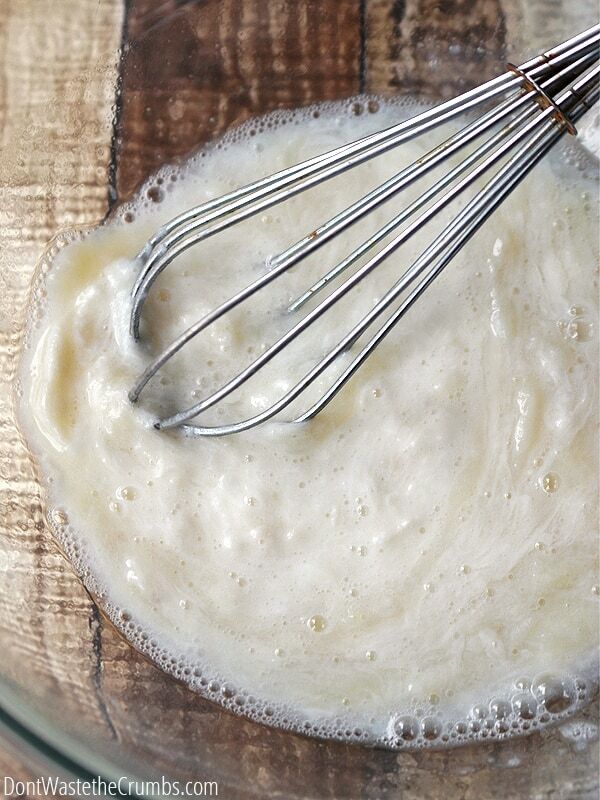 Here’s a recipe, but put it into a spray bottle instead of a foaming hand soap dispenser. If you want to buy a cleaner, make sure you look it up on either the EWG site or the Think Dirty app (preferably both if you can) to make sure it doesn’t have any harmful ingredients listed. Aim for one that’s ranked a 3 or higher and avoid any that have “fragrance” listed since there’s no telling what the company actually used to replicate that “mountain air” or “fresh linen” scent! I use Thieves Household Cleaner. I tested it against raw chicken alongside the vinegar and the surface came back perfectly clean! 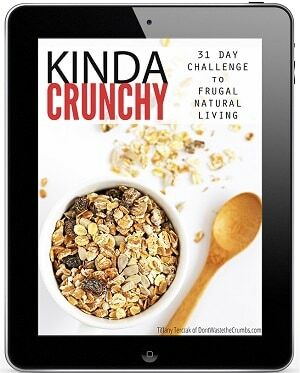 It also ranks a 1 on the Think Dirty app (which is the best rating you can get) and costs only 37¢ (compared to $4+ for a “natural” cleaner at the store that ranks a 7!). There are several issues with the ingredients found in most dish soaps. Formaldehyde can cause cancer and is a skin irritation. Ethanolamine can impact the respiratory system and nervous system. DMDM Hydantoin irritates the skin, eyes and lungs. Sodium Borate effects developmental, endocrine (hormones) and reproductive systems. Methylisothiazolinone is a known allergen and toxicant. But we should also be concerned about are the ingredients NOT listed. Some dish soaps use vague descriptions like “cleaning agent” or “surfactant” or “preservative” instead of the actual name of the chemicals. This should be a red flag, because again, why should we trust a company who won’t tell us exactly what’s in their products? What’s worthy to note here, is that in my research, dishwashing soap in general contained far less harmful ingredients than dish soap. If you have a dishwasher, I would use it as often as you can. Plus when you run a full load, you use less water than if you were to wash by hand. And then you can do something else instead of washing the dishes! I used the Think Dirty app to scan every single brand of dish soap on a local store shelf and two “natural” brands ranked 4 and everything else (including a few other “natural” brands) ranked a 7. 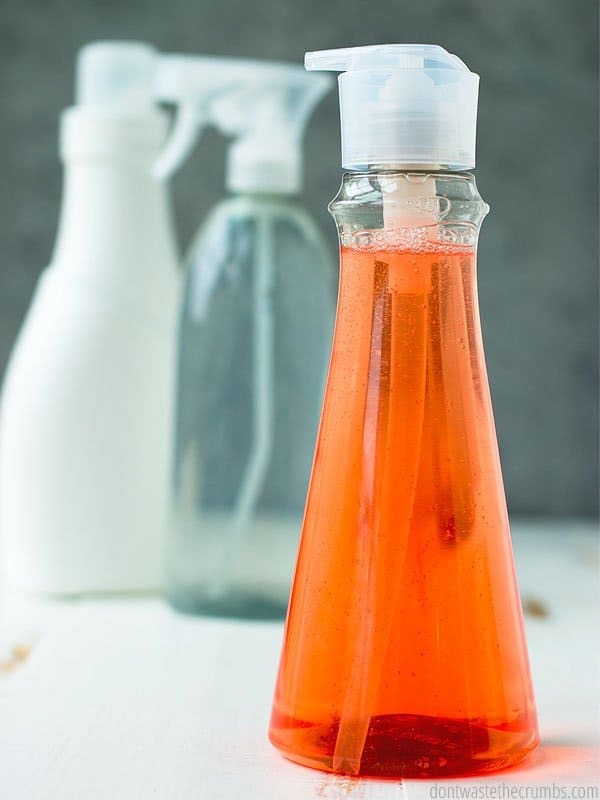 As you look for a better dish soap, make sure there’s an ingredient list and avoid the ingredients I listed above. Then use the EWG and/or Think Dirty app to learn more about the ingredients listed. I use Thieves Dish Soap. It contains none of the harmful ingredients listed above and it’s scented naturally using essential oils. It’s also highly concentrated and one bottle lasts me 3 ½ months! 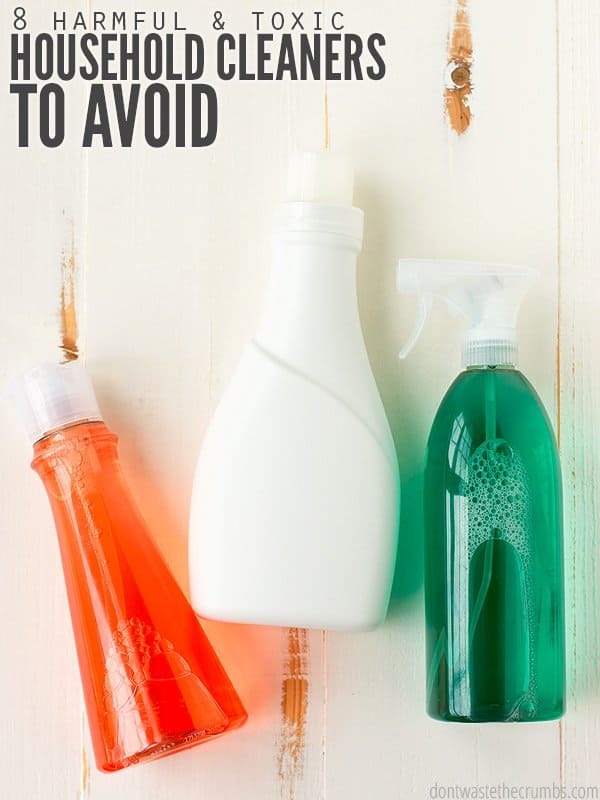 Bathroom cleaning products are dangerous because of the chemicals needed to satisfy the consumer’s desire to spend less time and effort cleaning. The only way to remove the need for a little bit of elbow grease is to increase the potency and quantity of harsh chemicals. According to this article, toilet bowl cleaners and drain cleaners can cause severe burns on eyes, skin and if ingested, the throat and esophagus. In particular, chlorine bleach (a common ingredient in bathroom cleaning supplies) and ammonia produce fumes that are highly irritating to the eyes, nose, throat and lunch. On top of this, chlorine and ammonia are highly reactive chemicals and produce lung-damaging gasses when they’re combined with other chemicals (like acids in toilet bowl cleaners). Toilets: baking soda & vinegar and don’t forget to clean the back of the toilet! If you choose to buy products, avoid anything that has a warning label on it. Even if you use it as an adult, the fumes still affect the little ones around you… even if they’re far away in another room! Also be very cautious of labels that say “natural” or “eco-friendly” or “green” or “wholesome” or any of that. 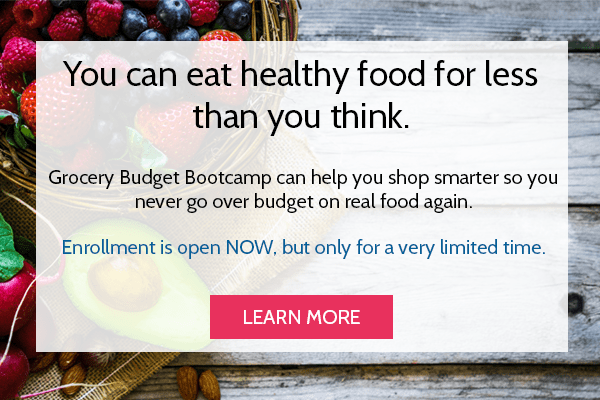 Do your research – companies that truly have a heart for healthy living will shout it from the roof tops. Those who don’t won’t have much to say on it. I use Thieves Household Cleaner for most jobs since it can clean all the various surfaces (including mirrors, counters, walls, doors, tub, tile, floor and the toilets). If I need scrubbing action, I use baking soda as well. I like to keep lemon essential oils and tea tree essential oil in my cleaning caddy. 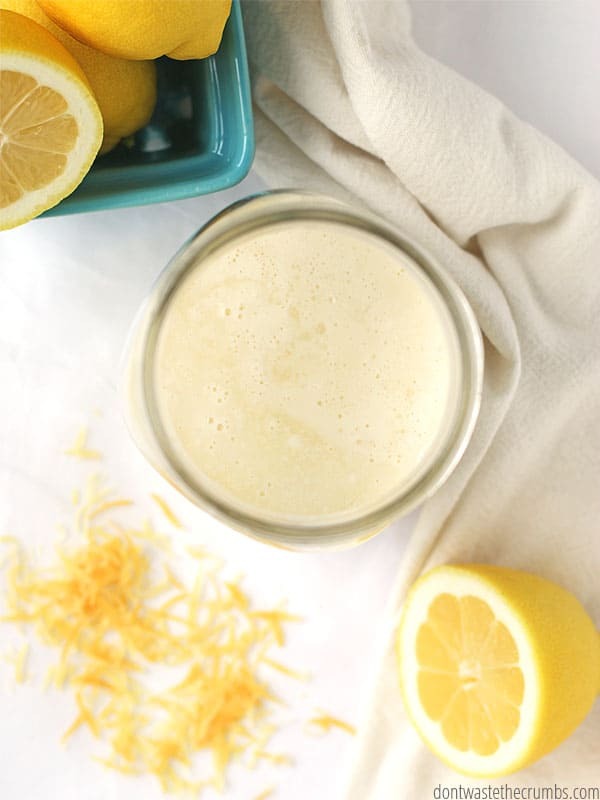 Lemon helps to cut though greasy spots (i.e. soap scum) and tea tree eats through mold and mildew. Right, right… so these chemicals are harmful, but will they really effect ME?! Honestly? I don’t know. We’re all built differently and we react to things in different ways. But I do know this – these types of chemicals can build up in our bodies over time and cause serious damage in the long run (like abnormal development in male fetuses and baby boys). We might not have a reaction today or tomorrow or even next week. But what about in five years? If you get a diagnosis in 5 years, you’re not going to think about the laundry soap or all-purpose cleaning spray you used four years before. And it won’t matter anyway because by then, it will be too late. And then there’s the common sense question: If I knew for a fact that something was dangerous, why would I willingly expose myself to it?! I’ve already included a few links to Amazon for some of the cleaning items I recommended, but definitely check your local warehouse stores (i.e. Costco, Sam’s, etc.) for the best prices on things like baking soda and vinegar. I mentioned that I use Thieves Laundry Soap, Thieves Dish Soap and Thieves Household Cleaner and I buy these through Young Living. I’m a wholesale member and save 24% off retail prices. The monthly box can be filled with whatever I want, so if I don’t need cleaning supplies I can order vitamins or supplements or essential oils or shampoo or make-up… whatever I want or need! There’s a stigma that essential oils and plant-based products are expensive, so I wrote this article on how we afford essential oils. I’ve also learned that the longer I’m a member of Young Living, the less I shop at stores like Target and Walmart. Staying out of the store means I’m less tempted to buy things I don’t need anyway. And when I crunch the numbers, I’m actually spending LESS money now than I used to! Click HERE and make sure 2298517 is in the member and sponsor field. Choose Wholesale Membership. Checkout and confirm your order. That’s it! *Essential Rewards (ER) is the monthly subscription box that saves me an additional 20% each month. It’s free to join and you can cancel at anytime. I’m offering a $25 product credit when you join my Young Living team and sign up for Essential Rewards! You can use this product credit however you see fit – buy a diffuser or more oils or sunscreen or insect repellent or protein powder or acne treatment – It’s your free money, so spend it however you’d like! Click HERE to join Young Living. Make sure 2298517 is in the member and sponsor field. Choose Wholesale Membership. Fill out your information and choose your starter kit. If you’re focused on cleaning, choose the Thieves Starter Kit. If you’re more interested in essential oils in general, choose the Premium Starter Kit. As an extra bonus on top of the $25 product credit, you’ll also get ANOTHER FREE OIL from Young Living! 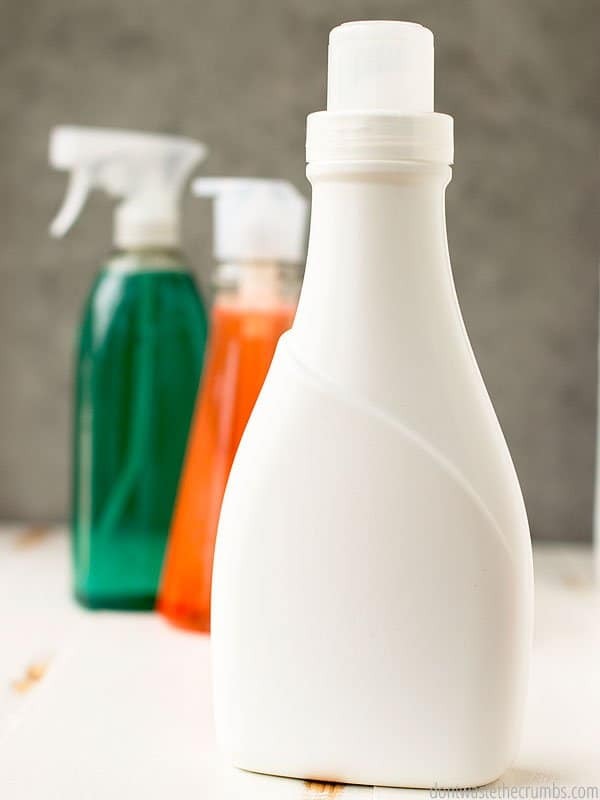 Have you started paying attention to the labels on household cleaners? Do any of the warnings scare you? 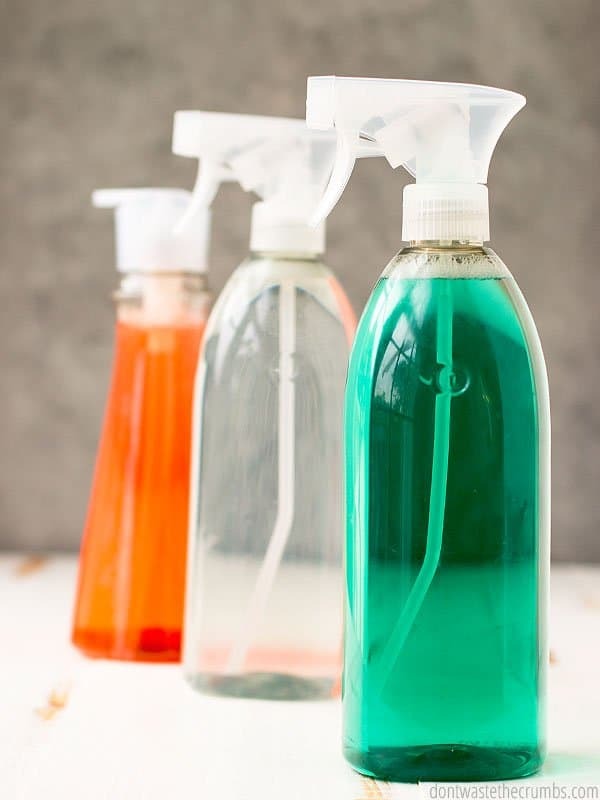 How have you transitioned into cleaning your home naturally and avoiding these harmful household cleaners? « How much does the Whole30 cost? Hi there! I was totally psyched about getting the Thieves starter kit and getting some of the yucky chemicals out of our home. I’m so grateful to you for doing this roundup and giving good suggestions about what can be used instead. I know I’ll be referring to it as we make some changes. I was a little bummed to see that Young Living requires a $50/month order to remain in the Essential Rewards program. I haven’t read all of the details yet – there are a lot – but it seems a lot more complicated than just placing an order. I’d be interested to know what you really do end up ordering, because you mentioned that the laundry detergent, for example, lasts a very long time. That’s helpful, thank you! Maybe we’ll try without the rewards program for now. I think we can add that in the future if it makes sense. I know that the Thieves line smells divine! That makes sense, and I agree – Thieves smells like Christmas to me! 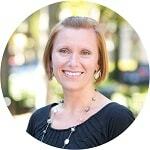 Let me know if you need any help getting started – here’s the link for my team: bit.ly/tiffanycrumbsYL. I look forward to being on this journey with you! People tend to think a different cleaner is needed for every part of the home. When in actual fact, you can often use the same solution you use to clean your loo as you do your kitchen counter tops or floor. Good old fashioned soap and water can be used to clean so much! for tougher grime and surfaces which require disinfecting, homemade disinfectants such as the ones above are excellent. Thanks for sharing your tips!